سلیمی, حسام, شاه حسینی, شاهرخ. (1397). شبیه سازی راکتور بستر ثابت سنتز فیشرـ تروپش در فرایند GTL با استفاده از فناوری دینامیک سیالات محاسباتی. 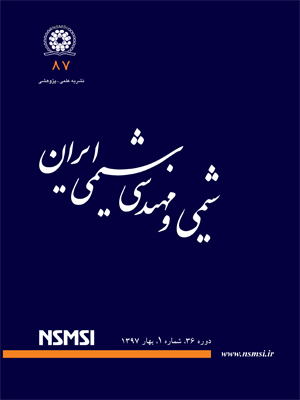 نشریه شیمی و مهندسی شیمی ایران, 37(1), 267-276. حسام سلیمی; شاهرخ شاه حسینی. "شبیه سازی راکتور بستر ثابت سنتز فیشرـ تروپش در فرایند GTL با استفاده از فناوری دینامیک سیالات محاسباتی". نشریه شیمی و مهندسی شیمی ایران, 37, 1, 1397, 267-276. سلیمی, حسام, شاه حسینی, شاهرخ. (1397). 'شبیه سازی راکتور بستر ثابت سنتز فیشرـ تروپش در فرایند GTL با استفاده از فناوری دینامیک سیالات محاسباتی', نشریه شیمی و مهندسی شیمی ایران, 37(1), pp. 267-276. سلیمی, حسام, شاه حسینی, شاهرخ. شبیه سازی راکتور بستر ثابت سنتز فیشرـ تروپش در فرایند GTL با استفاده از فناوری دینامیک سیالات محاسباتی. نشریه شیمی و مهندسی شیمی ایران, 1397; 37(1): 267-276. در این مطالعه تبدیل گاز سنتز استاندارد به هیدروکربن‌های خطی در یک راکتور فیشر ـ تروپش بستر ثابت تک لوله‌ای با استفاده از فناوری دینامیک سیالات محاسباتی (CFD) مورد بررسی قرار گرفته است. برای این منظور از یک مدل جامع دو بعدی شبه همگن شامل معادله­ های بقای جرم، انرژی، مومنتوم و اجزا و همچنین سرعت واکنش استفاده و توسط کد‌های محاسباتی، حل عددی شده است. راکتور از نوع پوسته و لوله بوده که با کاتالیست‌های کروی پایه کبالت پر شده بود. شرایط عملیاتی بدین قرار بود: دمای سیال خنک کننده 555 کلوین، فشار 17 بار و شدت جریان مولی گاز سنتز ورودی معادل با gmole/s 0335. رفتار پیش‌بینی شده میزان تبدیل کربن مونوکسید و هیدروژن، میزان تولید هیدروکربن‌ها، افت فشار و دمای سیال در طول محور راکتور مورد تجزیه قرار گرفت. نتیجه­های به دست آمده از این شبیه­سازی با داده‌های تجربی موجود، اعتباری سنجی شد. مدل ریاضی مورد استفاده، میزان تبدیل کربن مونوکسید و هیدروژن را به ترتیب برابر با 46 و 49 درصد پیش بینی کرد که در مقایسه با مقدارهای تجربی، به ترتیب خطای مثبت 15 و 14 درصدی را نشان داد. در مورد فراورده­ های واکنش، بیش ­ترین خطای به دست آمده در پیش بینی میزان تولید پروپان با 14درصد به دست آمد که نشان از تطابق خوب بین نتیجه­ های به دست آمده از مدل و داده‌های تجربی دارد. Trépanier M., Tavasoli A., Anahid S., Dalai A., Deactivation Behavior of Carbon Nanotubes Supported Cobalt Catalysts in Fischer-Tropsch Synthesis, Iranian Journal of Chemistry & Chemical Engineering (IJCCE), 30(1): 37-47 (2011). Tavasoli A., Anahid S., Effects of Confinement in Carbon Nanotubes on the Performance and Lifetime of Fischer-Tropsch Iron Nano Catalysts, Iranian Journal of Chemistry and Chemical Engineering, 29(3): 1-12 (2010). Marvast A.M., Sohrabi M., Zarrinpashne S., Baghmisheh Gh., Fischer-Tropsch Synthesis: Modeling and Performance Study for Fe-HZSM5 Bifunctional Catalyst, Chemical Engineering and Technology, 28(1): 78-86 (2005). Ji Y.Y., Xiang H., Yang J., Xu Y., Li W., Zhong B., Effect of Reaction Condition on the Product Distribution During Fischer-Tropsch Synthesis over an Industrial Fe-Mn Catalyst, Journal of Applied Catalysis A: General, 214(1): 77-86 (2001). Atwood H.E., Bennett C.O., Kinetics of Fischer-Tropsch Reaction over Iron, Industrial and Engineering Chemistry Process Design and Development, 18(1), 163-170 (1997). Bub G., Baerns M., Bussemeier B., Frohning C., Prediction of the Performance of Catalytic Fixed Bed Reactors for Fischer-Tropsch Synthesis, Chemical Engineering Science, 35(1): 48-355 (1980). Liu Q.S., Zhang Z.X., Zhou J.L., Steady State and Dynamic Behaviour of Fixed Bed Catalytic Reactor for Fischer-Tropsch Synthesis, Journal of Natural Gas Chemistry, 8(2): 137-180 (1999). Wang Y.N., Xu Y.Y., Li Y.W., Zhao Y.L., Zhang B.J., Heterogeneous Modeling for Fixed-Bed Fischer-Tropsch Synthesis: Reactor Model and Its Application, Chemical Engineering Science, 58(3): 867-875 (2003). Jess A., Kern C., Modeling of Multi-Tubular Reactors for Fischer-Tropsch Synthesis, Chemical Engineering and Technology, 32(8): 1164-1175 (2009). Guettel R., Turek T., Comparision of Different Reactir Types for Low Temperature Fischer-Tropsch Synthesis: A simulation Study, Chemical Engineering Science, 64(5): 955-964 (2009). Rahimpour M.R., Khademi M.H., Bahmanpour A.M., A Comparision of Conventional and Optimized Thermally Coupled Reactors for Fischer-Tropsch Synthesis in GTL Technology, Chemical Engineering Science, 65(23): 6206-6214 (2010). Brunner K.M., Perez H.D., Peguin P.R.P., Duncan J.C., Harrison L.D., Bartholomew C.H., Hecker W.C., Effect of Particle Size and Shape on the Performance of a Trickle Fixed Bed Recycle Reactor for Fischer-Tropsch Synthesis, Industrial and Engineering Chemistry Research, 54(11): 2902-2909 (2015). Chabot G., Guilet R., Cognet P., Gourdon Ch., A Mathematical Modeling of Catalytic Milli-Fixed Bed Reactor for Fischer-Tropsch Synthesis: Influence of Tube Diameter on Fischer-Tropsch Selectivity and Thermal Behaviour, Chemical Engineering Science, 127(1): 72-83 (2015). Rafiq M.H., Jakobsen H.A., Schmid R., Hustad J.E., Experimental Studiesand Modeling of a Fixed Bed Reactor for Fischer–Tropsch Synthesis Using Biosyngas, Fuel Processing Technology, 92(5): 893-907 (2011). Pontes M., Espinoza R.L., Nicolaides C.P., Scholz J.H., Scurrell M.S., Selection, Design and Scale Up of the Fischer-Tropsch Reactor, Natural Gas Conversion IV Studies in Surface Science and Catalysis, 107: 213-218 (1997).